I don't actually remember the moment I met my son. My labor was very, very atypical and not at all what I prepared for. I went into labor on Tuesday, November 28th at 2 pm, but did not have Emmett until Friday, December 1st, at 10pm. 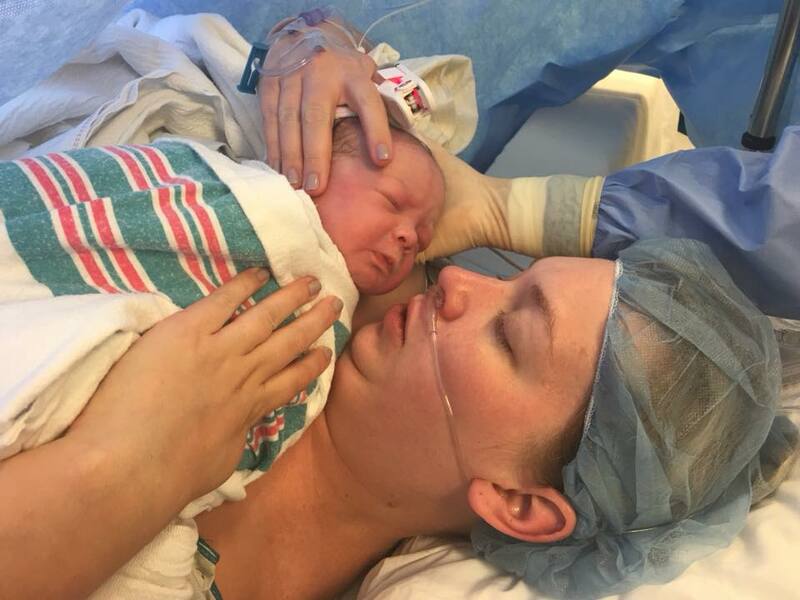 I prepared for an unmedicated experience, but on December 1st finally got an epidural and pitocin to try to help my body relax enough to labor more effectively. By the time my c-section started at 9:55 pm, I had been contracting 3-5 minutes apart for almost 80 hours, and my uterus...well it didn't really look like a real organ anymore. I bled, a lot, and my OB later told me it was like stitching up Jello. The bleeding and exhaustion caused me to start losing consciousness repeatedly, and I can't remember anything from the first cut until 5:00 the next morning. I woke up at 5 to realize my husband had asked them to keep Emmett in the nursery overnight for us so that I could sleep to recover. I also realized I had no idea what my baby looked like, and I thought, "I need my baby on my chest right this minute." My night nurse brought him to me and helped me hold him, and then left the room. Drew was still asleep, so it was just the two of us, and those early morning moments getting to know my son will forever be burned into my memory. 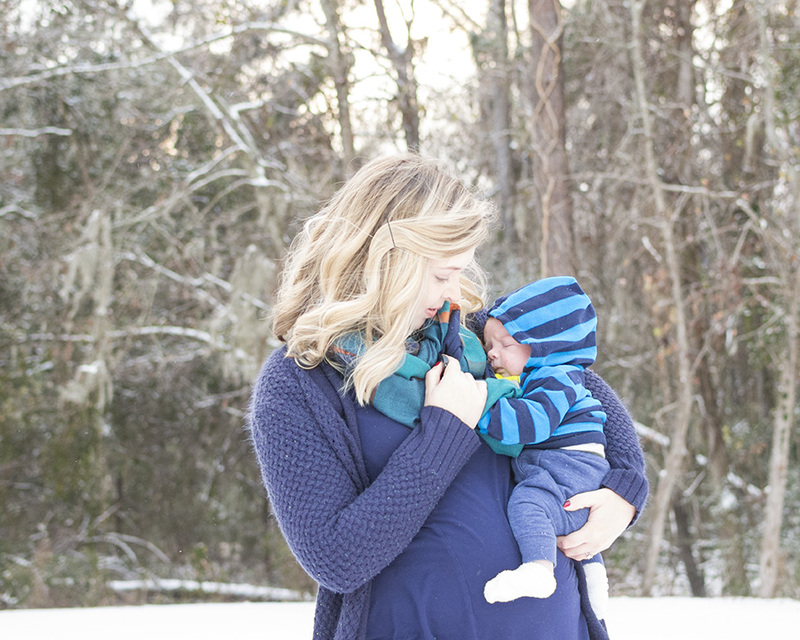 I had been afraid I wouldn't feel the connection immediately because pregnancy and labor had been very traumatic, but I had nothing to fear. The love was so intense and overwhelming and instant as he was placed into my arms in the dark hospital room when the rest of the ward was as quiet as it could be. It was like there was no one else in the world, just me and my baby, and I have never in my life felt so much joy and peace and love as I did in that moment. Watching him grow is my greatest joy. Every day that passes, I am amazed that God has allowed me to be Emmett's mother. Tomorrow, he will be dedicated at our church, and I will spend the day amazed at the magic that motherhood really is. It's hard and exhausting and all consuming and for a little while made me wonder if I could really come back here and do this work, when that work seemed like it was all of me. But it also has made me stronger. It has brought out the best in me, qualities and strength I didn't even know I possessed, and it's made my passions bigger and my dreams more vivid. He is my motivation, my restoration, and my joy, all in one bundle. I spent years longing for the day someone would call me mom and give me a little card or a sweet hug on Mother's Day, and my time is finally here, and while it certainly isn't perfect, and I probably have spitup in my hair as I write this, and I definitely forget "screen time" is frowned on and leave the TV on around him far too often, I would never want life to look like anything else. This weekend I get to celebrate this new version of me, the better, stronger, softer one, who loves deeper and dreams bigger and finds delight every day so much faster. But more than that I get to celebrate him. The little boy who changed me, and keeps changing me every day. I have worked with so many mothers and stepmothers and grandmothers and mother figures through photography and I wondered what it would be like to join their ranks every time, and now I know...the mom team is the best team I'll ever be on. For all the mothers who have gone before me, who are here beside me, who are waiting to join me...you are so loved. Thank you for paving the way for those of us just starting our journey, seasoned moms. Thank you for walking with us and holding our hands, mom friends. Thank you for your joy and support of us in our journey, moms in the making. We're here for you, moms longing to meet their children, moms not ready for this yet but excited for the day this is their life, and moms trying to deal with the unimaginable pain of loss this weekend. This is team work, and the mom team is amazing through the good, the gross, and the devastating. I am so proud to be here. I am so proud to know so many wonderful moms. I am so thrilled I get to continue meeting more of them and serving them with my camera. Happy Mother's Day to me, to you, and to all of us. You are amazing with poop stained clothes, drool covered furniture, and overwhelmingly full hearts.